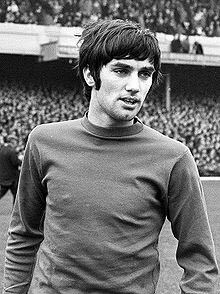 George Best was a footballer from Northern Ireland, who spent his most successful years playing for Manchester United. On form, Best was one of the most dazzling and attractive footballers of his generation. He had the rare ability to dribble past opponents and could be a real match winner. Best became one of the early footballing celebrities, but his fame and wealth created problems. His jet set lifestyle and love of partying contributed to his alcoholism which dogged the majority of his adult life. He died in 2005, aged 59 following complications after a liver transplant. George Best was born in Belfast, Northern Ireland. His parents were Protestants and members of the Orange Order. At the age of 15, his talent was spotted by a scout (Bob Bishop) working for Manchester United. Bishop famously sent Busby a telegram stating – “I think I’ve found you a genius.” Best was invited over to Manchester, and despite initially suffering home-sickness settled into Manchester and worked through the youth ranks to become an established member of the first team. Outside of the game, things went less well. George loved to party, drink and womanise. He famously relaxed for the 1968 European cup final by sleeping with “a particular young lady called Sue” This created friction between him and his stern managers at Manchester United. As his career progressed, his off the field troubles increasingly affected his performance. Towards the end of his career, Best would be increasingly missing training practices and his top end speed fell off. His performances became more erratic, but there were still glimpses of the old Best magic, and he was a big draw wherever he went to play. Best played at a large variety of clubs from Los Angeles in the US soccer league to Hibernian in Scotland. He played for Northern Ireland on 39 occasions, but missed out on the opportunity to play in the World cup, where he undoubtedly would have excelled. Off the field, his alcoholism frequently got him into trouble. He was sent to prison in 1984 for drink driving and assaulting a police officer. His most embarrassing moment was appearing on an edition of Wogan in 1990 where he was heavily drunk. Best said this was the nadir of his alcoholism. In 2002, he was given a liver transplant on the NHS. This was controversial because of his heavy drinking. In November 2005, Best experienced liver complications as a result of drugs necessary for dealing with a liver transplant. After a long battle, Best died on 20 November. A minutes silence was observed at football grounds around the country.